Stephen Hawking was often referred to as the greatest physicist since Einstein, and he is viewed as a hero by many who feel he taught the world much more than cosmology and theories on gravity. His story is objectively inspirational, having outlived Lou Gehrig’s disease by more than 50 years while at the same time changing the way the world viewed and understood our universe. Beyond physics, he opined on many subjects, from climate change to aliens, and made predictions that aroused the imagination. As a company that got its start in Artificial Intelligence, it is Hawking’s prediction about AI that we have always found the most compelling. In the wake of his passing, we thought it would be interesting to review this prophecy and examine it in the context of enterprise business technology. At a conference in Lisbon, Hawking spoke about AI, saying that it could be “the worst thing ever to happen to humanity.” He warned that because AI has limitless learning capabilities, eventually it will replace humans. This alarming view is reminiscent of the world of The Matrix, where machines are in charge and seek to eliminate humans due to their imperfections. Sounds scary, so let’s try and ease any fears by level-setting a bit around AI. Hawking was a visionary who made great intellectual contributions to society, so we ought not dismiss his views as pessimism or lack of understanding. But they are sensational, much like many of the articles, opinions, and predictions about AI that make the news. Our view of AI, particularly today and for the foreseeable future, is quite a bit different. 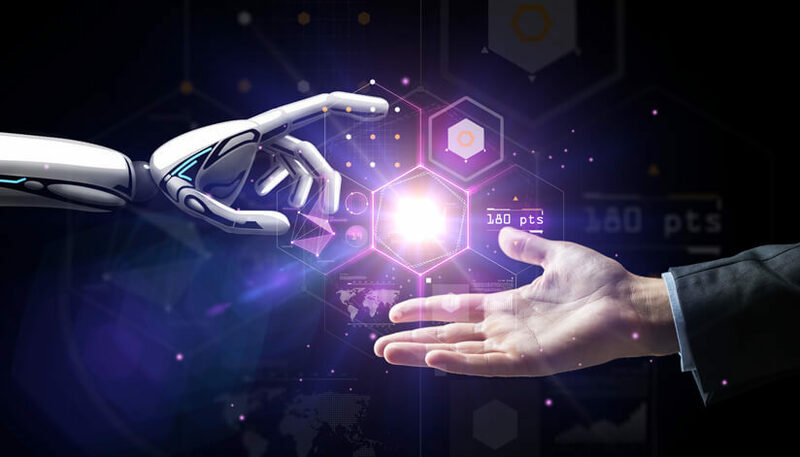 We view AI from the business perspective, focusing on how it helps answer solvable problems more efficiently and cost-effectively than a person might while following a lot of the same logic that a person would use. The value of AI is to supplement human work, not replace it. The components that constitute intelligence are such that machines of today actually should not be designed to replace human work because they will fail utterly. Hawking’s fear is that someday we will arrive there. In the business world, the fate of humankind is not often your top concern–though efficiency and scalability challenges feel like small potatoes in comparison! Realistically, executives are evaluating how to enhance processes, retain customers, and grow profits. There are many paths to success, and one of them is with AI. The business AI of today is built to mimic human behaviors, whether in conversation or process, and enhance the experiences that everyone—from employees to customers to shareholders—has with a brand. AI is highly effective in a narrow scope (i.e. business functions) and non-existent as a sentient being, so you shouldn’t be concerned that the new AI technology you introduce to your business is contributing to the eventual demise of civilization. In fact, the more companies that implement AI, the more knowledgeable the world becomes about its capabilities. This will help us to continue to improve the technology for positive, beneficial purposes while maintaining the checks and balances needed to keep it from spiraling out of control. One such example was Tay, a self-learning Microsoft bot for Twitter. Besides the not-so-surprising revelation that there are mischievous internet trolls out there, Tay was a warning for AI developers everywhere that self-learning bots are not ready for the primetime. Even today, self-learning technology is shied away from in the business world, due to the potential of a rogue bot offending a customer, deleting important files, or worse. While this could be seen as an example of the nefarious potential of AI, we view it as valuable learning that is now part of the collective knowledge about how to design and implement machine learning mechanisms. There is an old saying in AI research: once a problem is solved, it is no longer considered AI. Perhaps one day we will look back at the systems of today and think, “Well, that wasn’t really AI.” At that point, maybe we’ll be closer to the time that Hawking fears. But until that time comes, it is important to utilize the tools at our fingertips and use intelligent technologies to better the world as best we can.